Eight strangers are invited to an isolated mansion on Indian Island off the coast of Devon. On their arrival they are greeted by the butler and his wife.........and then there are ten. On the wall of each bedroom is a copy of a differently worded but still familiar old rhyme and at dinner they notice an unusual centrepiece of ten little Indian figurines. During coffee a 'voice' is heard accusing each guest of murder and shortly after one of them chokes and dies, the first of a succession of deaths that leave the remaining members of the group increasingly afraid and suspicious of each other. Agatha Christie takes the traditional 'country house' setting and adds her own ingenious touch. From the beginning the reader knows what is going to happen and the suspense is built by not knowing who, when or how. With no detective it's also left to the reader to seek the clues and try to figure out who the murderer is - I certainly didn't but it was fun trying! Very clever and I can see why it's considered to one of the author's best works. A short, fast read which I enjoyed immensely. Very clever indeed :-) such a fun book to try and figure out. I keep saying I have to try another by her. I haven't read that many but this is the one I like most so far. This is my favorite Agatha Christie book. I love that I couldn't figure out the killer. It is the perfect murder mystery. There is a YA book coming out this fall that is based on this one (Ten by Gretchen McNeil). It will be interesting to see how it compares. Definitely going to be a favourite of mine too. I re-read this recently, and it was just as eerie as I remembered. It was an eerie setting and the originality of the format made it even more so. 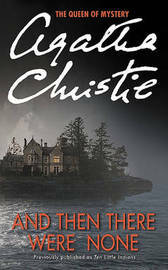 This is one of my favorite Christie novels. Such a tight and well woven plot. I once saw a play based on this novel where they changed the murderer but the rest of the story stayed the same. very engaging. It seems to be everyone's favourite - I'm surprised I never read it before now. This is my favorite Christie novel. I love it! The original title was even worse and would be totally unacceptable these days. It is a very clever mystery novel. One of my favorites, if not my favorite. Glad you liked it. I did! And rather surprised I've never read it before. I love mysteries and I have always intended on reading one of her books! I finally picked out one at the library this week, 'Endless Night' to read on vacation. Hope you'll enjoy it and I do recommend this one - very original.